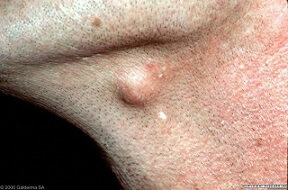 Sebaceous cysts are small growths that are non-cancerous in nature and appear as bumps under the surface of the skin. 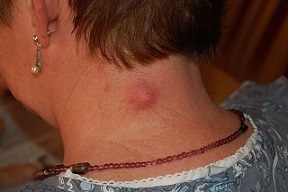 The cysts may contain liquid or semi liquid material and are commonly found on the neck, face, upper back, upper chest, torso or other parts of the body. These cysts are benign but they may be uncomfortable if they remain unchecked for a long time. They grow slowly and are not painful; however, they may be red, sore and tender due to infection or inflammation. 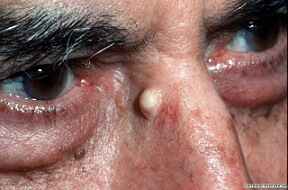 The cyst is in the form of a nodule and has a point at the top as a black spot known as the punctum. 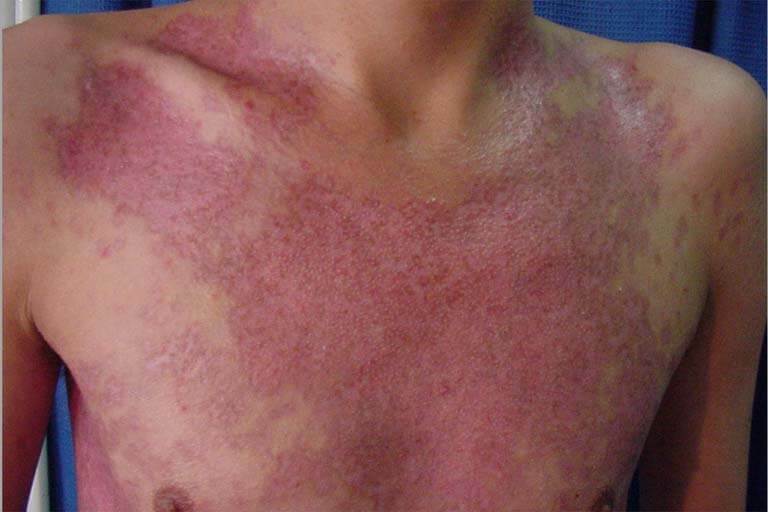 The raised area on the skin is harder and may be white or yellowish in color due to the presence of pus. Movement of the cyst and the surrounding skin is possible because the cyst is not fixed to deeper layers below the skin, if a cyst cannot be moved around, it may be an indication of a more serious health complication. Blocked sebaceous glands: Sebum is the oil that coats the hair, the skin and the sebaceous gland is responsible for its production. There are pores in the body that allow this oil to pass through and leave. When there is a blockage in these ducts, it leads to the development of sebaceous cysts. Trauma: The skin may experience damage due to an accident or injury such as grazing, burning, cuts, etc. In such a situation, there may be excessive presence of sebum that does not get the adequate space to flow out of the body, thus causing a cyst. Sunburn: The harmful ultraviolet rays of the sun are capable of causing great damage to the skin. It may trigger over excretion of sebum that may not get the necessary path to leave the body. People are usually advised to avoid going out when the sun is at the peak of its heat. Swelling of hair follicle: The root of the hair is the source of the sebum. If the hair follicle swells, it gives the oil more space and a chance to accumulate. This storage of the sebaceous oil over a period of time results in the formation of a cyst. Waxing or shaving: Both waxing and shaving involve the skin coming into contact with a razor or chemicals. Repeated exposure to the skin could cause trauma that later result in the occurrence of sebaceous cysts. History of acne: An individual who is prone to outbreaks of acne and other related skin problems is at a higher risk of developing sebaceous cysts. The person may already have a high production of sebaceous oil which is the primary component of the cyst. High testosterone levels: Men who have high levels of testosterone are more likely to develop sebaceous cysts. The outbreaks occur especially in the prostate region and the growth is rapid. Home treatment: If the cyst is tender or swollen, applying a moist warm compress can be helpful. The application of some amount of heat on the bump eases the pain as well as softens the contents of the cyst so as to allow the liquid or semi liquid material to flow out and rectify the swelling. Draining: Surgically draining the contents of the cyst may be helpful in reducing the pain and discomfort that the individual experiences. 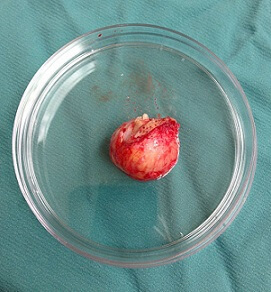 The doctor can cut the cyst and push out its contents. However, there are chances of reoccurrence of the cyst. Surgery: This involves a minor surgery during which the surgeon removes the entire cyst wall. The chances of the reoccurrence in case of this method of removal are comparatively less. Laser removal: The method of removal uses certain laser techniques to get rid of the cyst by lowering the risk of infections at the site of surgery due to the minimal use of surgical tools. Laser removals take less time, are more efficient and have a low chance of scarring. Most often sebaceous cysts are benign but differentiating them from other cysts can be difficult. Therefore, it is advisable that people must consult a doctor if they experience pain and other symptoms in addition to the appearance of the cysts.